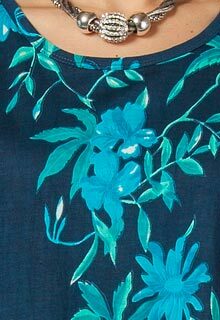 With an updated look to La Cera's nicely styled A-line womens cotton dress, the lovely flowered pattern stands out beautifully against the navy backdrop. This dress is a stylish grab-and-go for a house dress or for outdoor festivities in warm weather. Made in India for La Cera. 2523-16236.